He's growing up on me. He recently decided to get baptized (one week from today is when that will happen) and he's been plowing through AWANA materials, trying to get all four T&T books done in the two and a half years he'll be part of the program. He just had a birthday on Thursday, and he's now 11. When shopping for clothing to wear to his grandma's funeral (because his pants literally came to just below his knees!) he went for the shirt you see here (Grandma would love it, it's so bright!) and he had to have a bow tie ("Bow ties are cool!") to go with it. He still loves comics though. And while there was a bit of hesitation about the whole idea of the Bible being a big, long comic strip, he quickly came around. Whenever he sits down to read The Action Bible, he immediately shares the story with anyone who will listen. 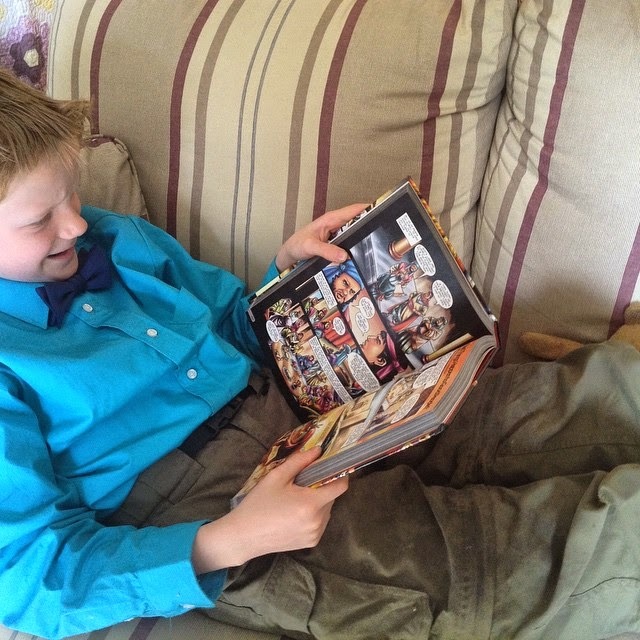 The whole graphic novel thing definitely draws him in and keeps him reading. Now, this isn't a Bible you can use to study your AWANA verses. It probably isn't the best choice for following along with the sermon at church. But as a Bible to "just read" it definitely has huge appeal. It isn't just comics. There are maps that fit in so that you want to look at them. There are sometimes little scroll backgrounds with a Bible verse, or the Ten Commandments, or other things that are being set off as special. One thing I really love is that this isn't just another story Bible, with the usual 'Top Ten Greatest Old Testament Hits' approach. This covers all kinds of biblical text, not just the usual ones. I see references to every book of the Bible except Song of Solomon. I can live with that. I'm not sure I want to see Song of Solomon as a graphic novel. Just saying. I was skeptical, I'll admit it, but I really do love this Bible. The 'action hero' aspect helps make the stories memorable, and I suspect that this familiarity will serve the kids well when they next encounter the "real" text. I have a $25 Appreciation Certificate to Family Christian to give away. You can use that to purchase of your own copy of The Action Bible (which is only $18.89 right now), or anything else you want. Maybe a new Bible! My old "regular" one was apparently (quite fabulous lime green and fuschia) bonded leather, which is flaking off now. And I love my Homeschool Mom's Bible but the translation isn't my fave. Maybe something in the NAS version would be timely now. There are always new Bible study materials and Christian living books that I'd like to buy. Perhaps more books than I have time to read, definitely more books than I can afford. I might get that Bible. It looks great! I'd likely get a new Bible, and maybe a novel. I've seen that they have some that I might like in the $5 range. And yes, 11 seems old when it's your kids. My oldest hit that milestone six months ago. I would save it and buy the new Hillsong album! 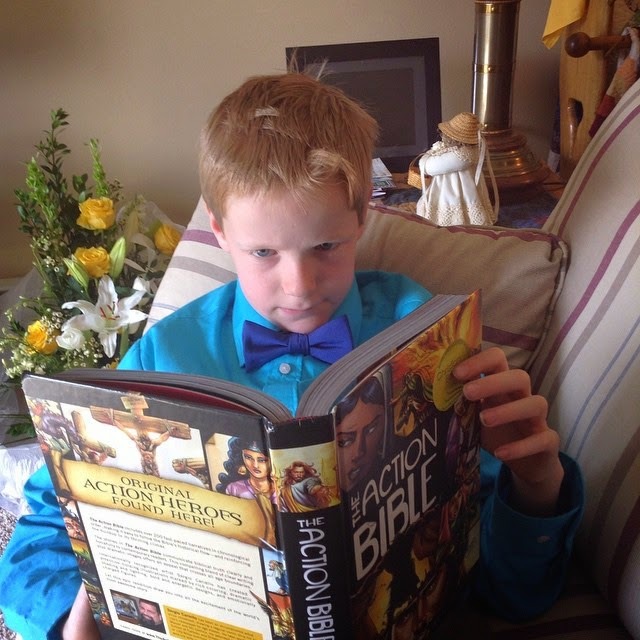 First, I love the action Bible...and so do my kids. Good choice! I'd get a book on Biblical archeology, or maybe Christian music for my kids. I would get a wall hanging for my bedroom.